Upfront tumor DNA sequencing might simultaneously provide both better detection sensitivity than standard tests, and critical information for treatment. 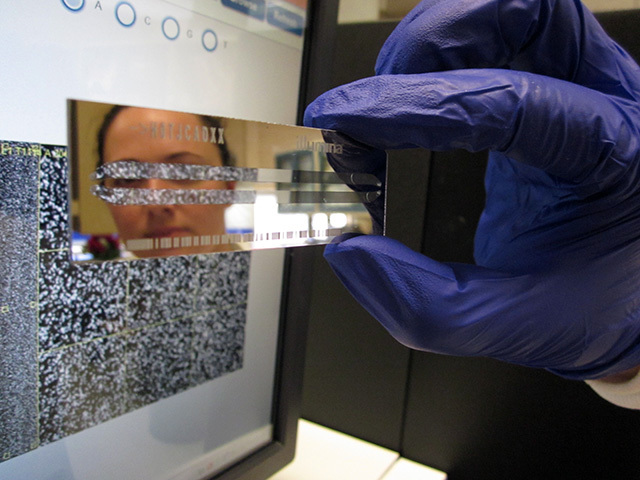 A laboratory medicine scientist's image is reflected in an UW-Oncoplex flow cell as the tumor DNA sequencing test is underway. An up-front tumor sequencing test also could simultaneously provide additional data that might help guide treatment. These are the conclusions of a study published March 29 in JAMA Oncology, one of the scientific journals of the American Medical Association. Lynch syndrome is the most common inherited predisposition to colon cancer. It also increases the risk for certain other cancers, including those of the gastric tract, ovaries or endometrium (the lining of the uterus). The research comparing testing for Lynch syndrome was led by Heather Hampel and Rachel Pearlman of the Ohio State University. The project was part of the multi-center, population-based Ohio Colorectal Cancer Prevention Initiative. Albert de La Chapelle of Ohio State University, and Colin Pritchard and Brian Shirts from the Department of Laboratory Medicine at the University of Washington School of Medicine, were among the senior authors. Pritchard also is a physician scientist and director of clinical diagnostics at the Brotman Baty Institute for Precision Medicine in Seattle. Pritchard commented: “Lynch syndrome screening is very beneficial for colorectal cancer patients and their families, but the current multi-test screening strategy is quite complicated for both patients and providers to navigate. Our study demonstrates that Lynch syndrome screening can be streamlined with a single up-front tumor test, without sacrificing test performance." “Testing methods of the past would just point to a suspicion of Lynch syndrome, but they could not confirm the diagnosis without multiple additional tests, which slows down the diagnostic process and adds costs,” saidHampel. The researchers explained that universal tumor screening for Lynch syndrome is advised for all patients after they are diagnosed with colorectal cancer. Their analysis adds support for using up-front tumor sequencing to effectively replace many current tests on colorectal cancer tumors to screen for Lynch syndrome. There are several approaches currently used for screening that can involve up to six tests performed consecutively. Lynch syndrome is present in about 3 percent of colorectal cancer patients. Identifying Lynch syndrome in patients, and subsequently, in their relatives, allows them to benefit from intensive cancer check-ups and preventive measures, including medications and surgical procedures. “Traditional sequential testing can be complex and confusing to patients and clinicians,” the researchers wrote. In addition, completing the entire series of tests takes a while, which means that some patients won’t return for lab follow-up work. Pritchard commented: “Lynch syndrome screening is very beneficial for colorectal cancer patients and their families, but the current multi-test screening strategy is quite complicated for both patients and providers to navigate. Our study demonstrates that Lynch syndrome screening can be stream-lined with a single up-front tumor test, without sacrificing test performance. The researchers wondered if the diagnostic workup for colorectal cancer patients could be made easier and offer better sensitivity and specificity than the current screening protocols. Sensitivity is a measurement of a test’s ability to correctly detect true positives, for example, that the patient actually has a certain disease. Specificity rates the test’s ability to indicate that the disease is not present. In this latest study, the researchers compared the sensitivity of tumor sequencing with that of current molecular tests (microsatellite instability testing and immunohistochemical staining) in detecting Lynch syndrome. The tumor sequencing was conducted with the University of Washington-OncoPlex, a next-generation, clinically validated deep sequencing panel. An expert molecular pathologist, from whom all the clinical and molecular data was hidden, analyzed and interpreted the sequencing results. This assessment was repeated by another, independent molecular pathologist. The researchers tested tumor DNA from 419 patients with colorectal cancer, ages 20 to 96, who were also undergoing standard universal tumor screening. The researchers also ran the tumor sequencing testing on 46 patients known to have Lynch syndrome. Sequencing succeeded in finding all of those cases. It also picked up an additional 12 cases of Lynch syndrome in the 419 patients who were being studied prospectively. In comparison, microsatellite instability testing and immunohistochemical staining both followed by a gene mutation test, missed five and six cases of Lynch syndrome, respectively. The tumor sequencing also found 284 cases of mutations in certain genes (KRAS, NRAS and BRAF). Such genetic information could guide cancer therapy for stage IV colorectal cancer. The tumor sequencing also found eight patients with a mutation that confers toxicity to fluorouracil chemotherapy, information that could be useful for cancer treatment selection. In describing the limitations of the study, the researchers said it’s possible, but not probable, that both reference standard and the index tests they performed missed some cases of Lynch syndrome. They noted that a drawback of the current tumor sequencing test: It has not yet been optimized to detect all possible germline mutations. Germline mutations are those that might be passed along to offspring. For example, it is unlikely that the present form of the test could discover mutations in particular regions of some genes where mutation detection is difficult. Although it was not the aim of this particular study, the DNA testing did uncover 36 additional cases with potential germline mutations in other cancer susceptibility genes. This suggests that tumor sequencing tests in colorectal cancer patients could be improved to search beyond looking only for mutations implicated in Lynch syndrome or variants known to affect colon cancer treatment. The researchers emphasized that tumor sequencing, like the molecular tests they compared it to, is a screening test. Patients with normal results, but who have a personal or family medical history that raises concerns, might need to be referred for further cancer genetics evaluation. Patients for whom the test revealed suspected germline mutations would need confirmation through a single-mutation test. That test, however, is less expensive than the full gene sequence or next generation sequencing panel. The Ohio Colorectal Cancer Prevention Initiative is supported by a grant from Pelotonia, an annual cycling event in Columbus, Ohio, that supports cancer research at the Ohio State University. The study also received funding in part from a National Cancer Institute grant, P30CA16058. The germline next-generation sequencing testing for a subset of the participants was donated by Myriad Genetics Inc. In their published paper, three of the researchers disclosed potential financial conflicts of interest.